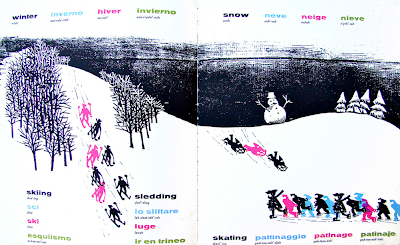 Letterology: How Do You Say—Snowplay? From one of my favorite artists, Antonio Frasconi. This page spread is from one of his multilingual childrens' books, See Again, Say Again from 1964. It is a book printed in four languages and chock full of his delightful woodcut illustrations. Via Art Crazed photostream because I was too lazy to scan my own copy of this book.